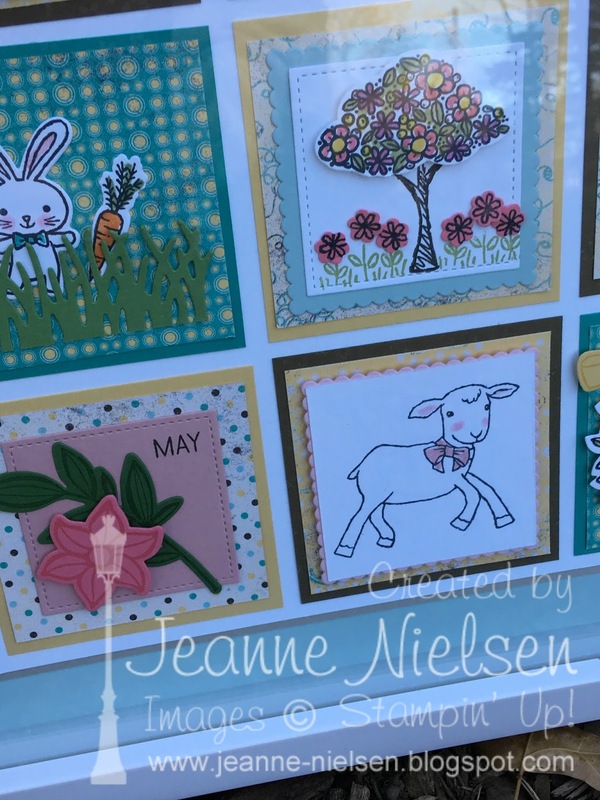 I had fun designing this month's birthday card class!! Every month I have a special class dedicated just to birthdays. We make 4 birthday cards -- 1 masculine, 1 kid's card, and 2 more feminine cards. We have cupcakes, and if it's someone's birthday in the class, they get a special $5.00 coupon as well! 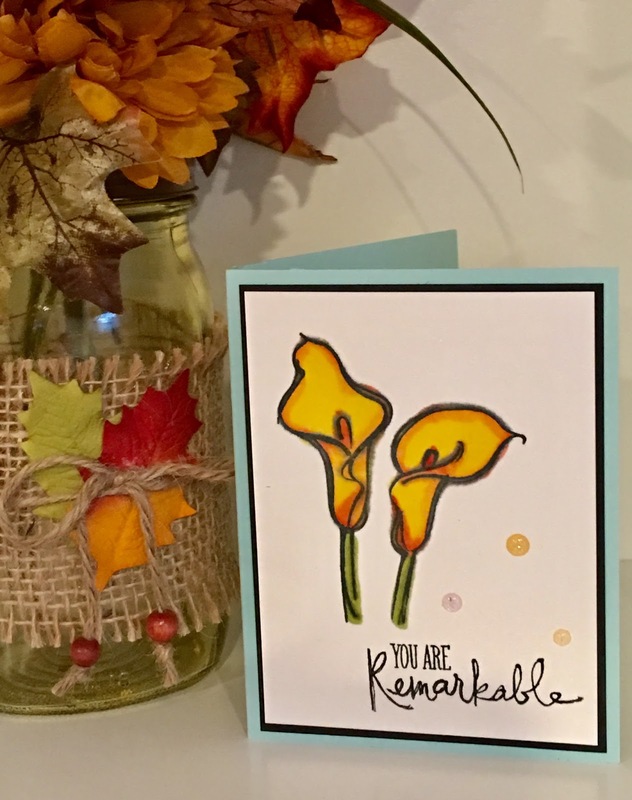 I have to say that the card on the left is NOT my own. 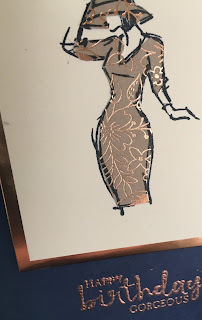 A fellow team member received it in a swap and shared it with me -- love at first sight! I TOTALLY cased it! I may have changed the "happy birthday" sentiment, but otherwise, nothing is different! Why change what works!! 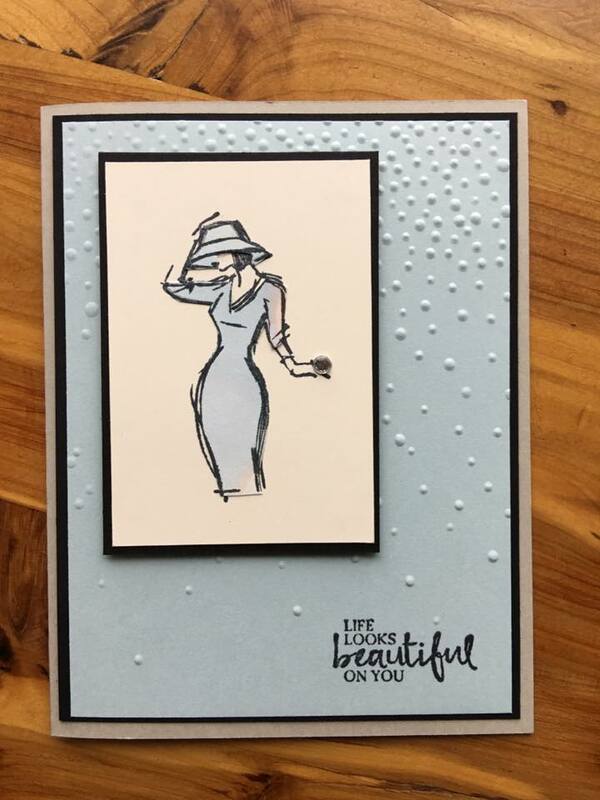 I'm waiting to hear from my team member as to who created the card so I can give credit where due -- I'll edit this post when I hear from her! If you can't see, it uses the eclectic framelits and DSP as well as the banner punch. 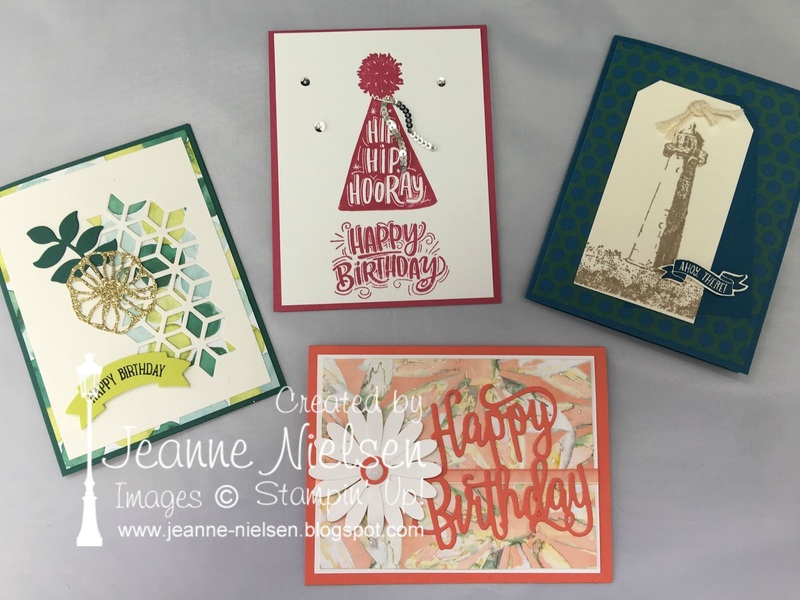 My favorite card that I designed is the bottom center card -- I used the new daisy DSP, the Happy Birthday thinlit, the daisy punch, and the new Calypso Coral ombre ribbon!! So sweet!! 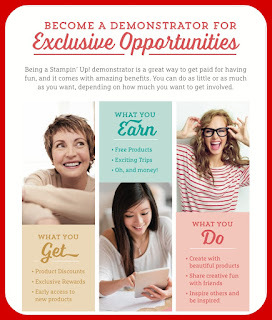 The ingredient list (all stamps, framelits, punches, accessories and DSP) is below! If you have a question about colors, just leave me a comment! 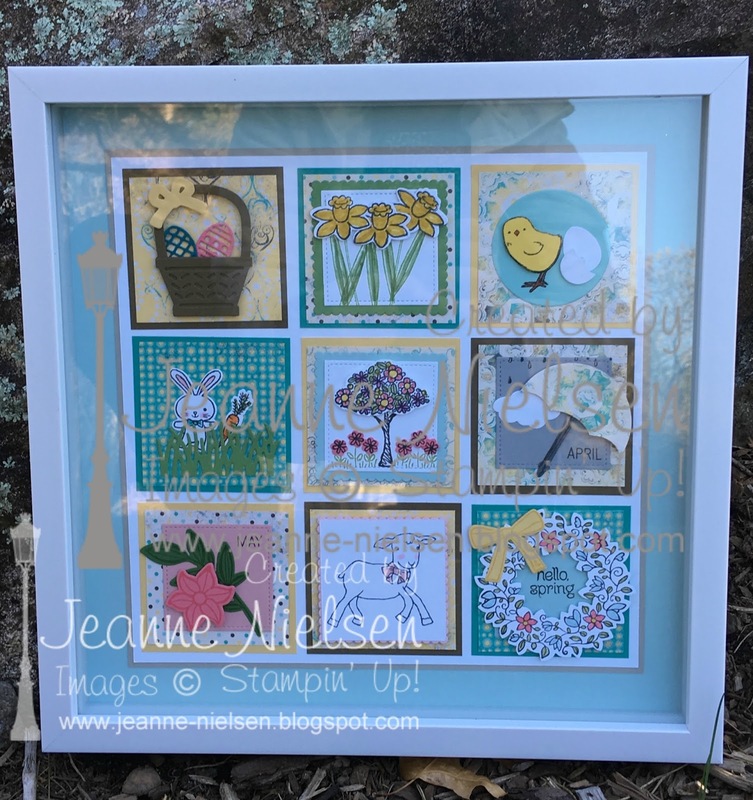 When I was cleaning out my craft room this past winter, I came across a winter sampler frame I had made a few years ago. 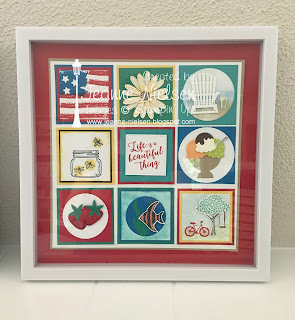 The frame was super easy: (9) 3" x 3" squares, pleasantly combined and mounted on bigger mats in a 12" x 12" frame. 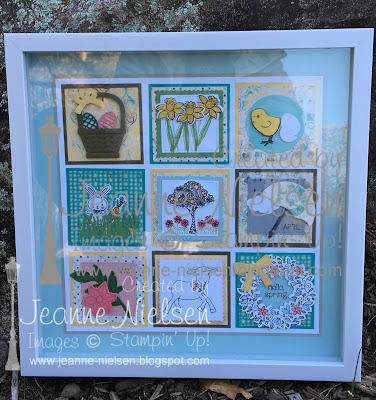 Since that time, I made a Valentine frame, and a spring frame and had requests for a summer sampler frame. I used only current stamp sets -- I think you can click on the picture to enlarge it. Check out my supply list below for the list of stamp sets (If I used both stamp sets and punches or framelits, I will list the bundle only.) The frame was a 12" x 12" scrapbook frame that I purchased with a coupon from Michaels. I've been able to find this particular frame in both black and white. If you have time, perhaps you can recreate this frame? 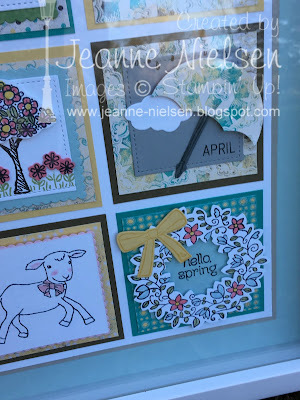 It's very easy -- just choose 9 stamp sets/images that fit your season and have fun putting together a collage! If you do recreate it, please share your creation with me! I'd love to see it!! *In the meantime, I now have requests for fall AND Halloween sampler frames -- I can't wait for the new Holiday Occasions catalog! Did you know that as a demonstrator you can preorder from the holiday catalog on August 1st?! Woohoo! 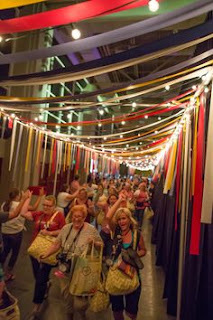 Check out how to join my awesome team, the Papercrafting Genies, HERE! 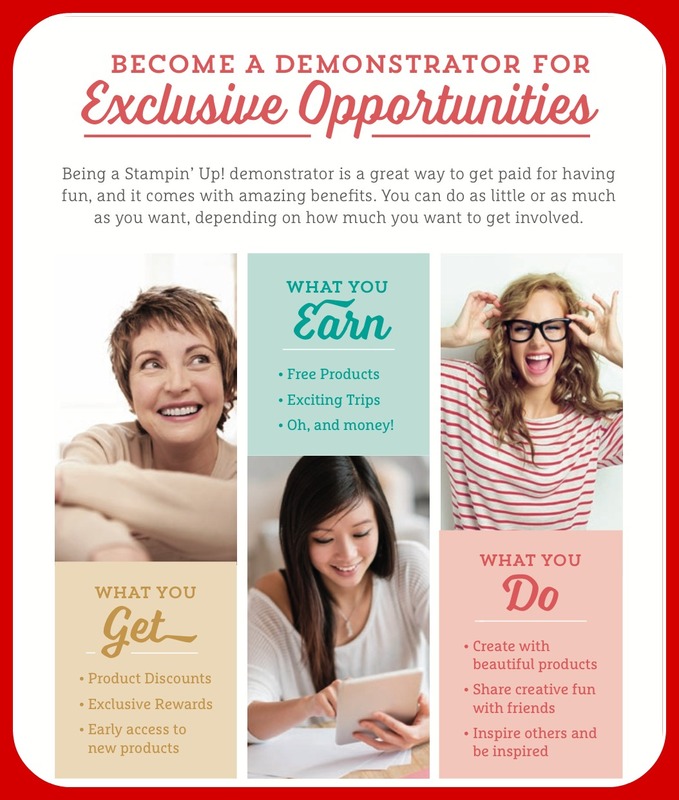 It was our annual Stampin' Up! demonstrator team party this past Sunday. We always get together for fun and a 3D Yankee swap. 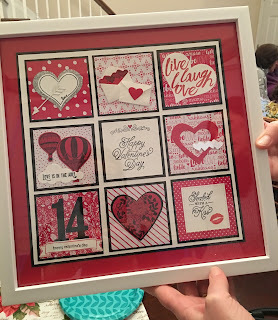 I was strapped for time and ideas, so I made a wall sampler using several current "love" stamp sets and framelits. 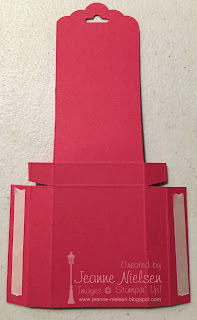 The frame is 12" x 12" with a Real Red c/s mat that is also 12" x 12". Next I attached a 10" x 10" Basic Black mat, followed by a 9 3//4" x 9 3/4" Whisper White c/s mat. All squares are backed with 3" x 3" mats, and then I chose 4 papers, front and back, from the Sending Love DSP stack for 8 of the 9 squares. The middle square is Whisper White c/s, also 2 3/4 x 2 3/4, that I stamped with the sentiment from the Sealed with Love stamp set. 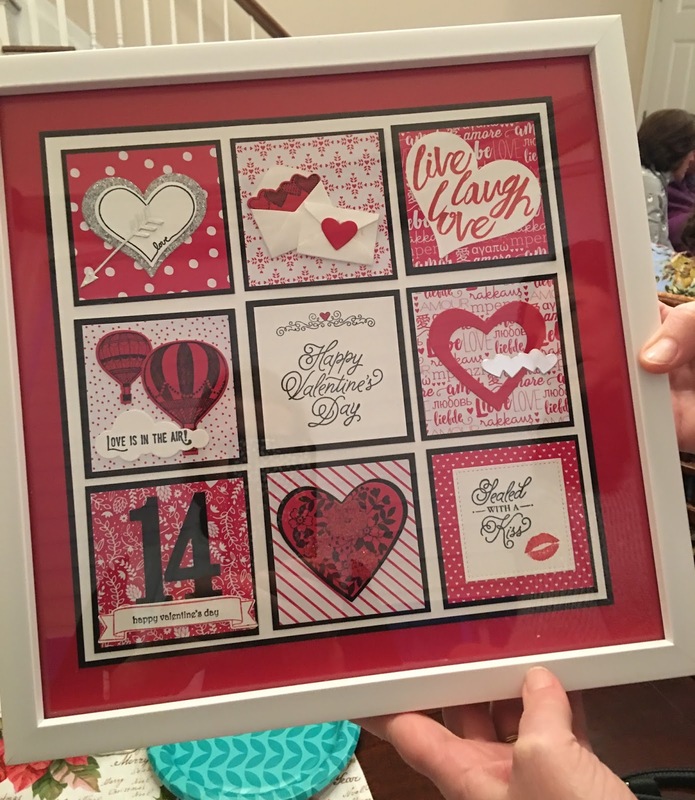 I colored the little red heart in with a Real Red marker, but I meant to use one of the hearts from the Brights shapes embellishments (they were MIA after emptying my craft room last week so I had to improvise!). P.S. 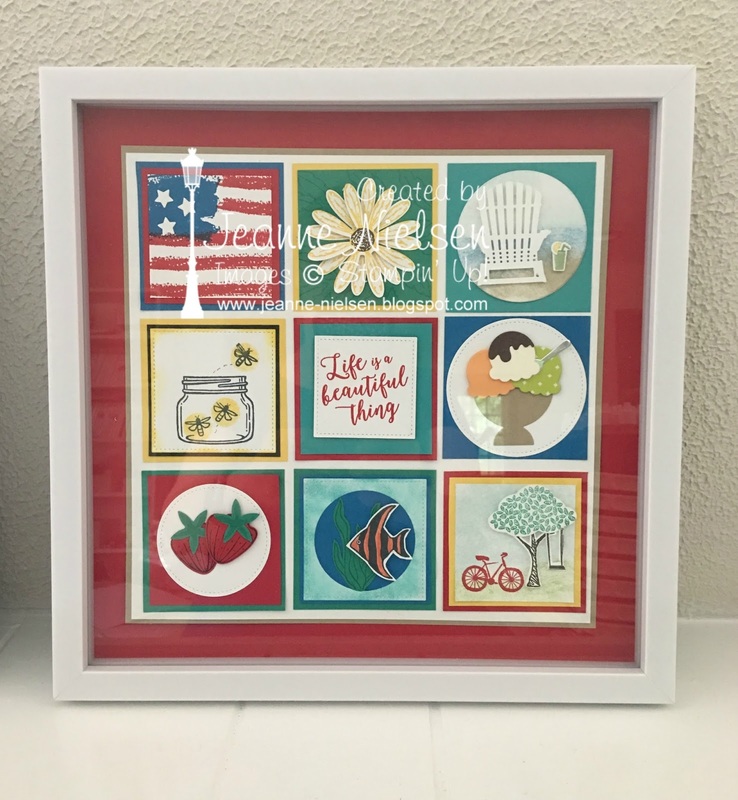 The frame is from Michael's and is a shadow box frame. I stamped and cut double the shapes when making my swap gift so I could keep one too -- I hope to switch out the samplers for different holidays so we'll see how my intentions go!! Thanks for dropping by!! The different stamp sets and framelits will all be listed in the supply list (I'll include both individual clear or wood mount stamps as well as individual framelits plus bundle info for all) but feel free to leave me a comment!! I'd love to hear what you think!! 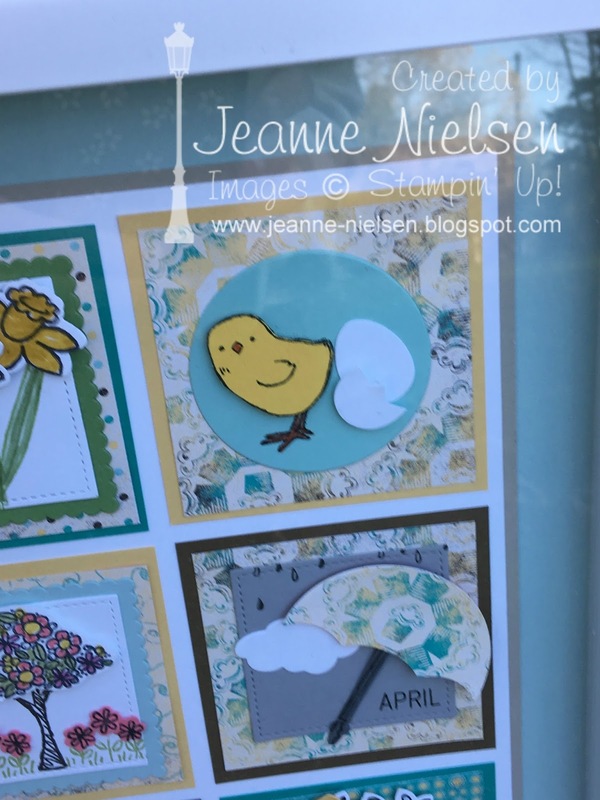 I have another card to share today, again using the Beautiful You stamp set! 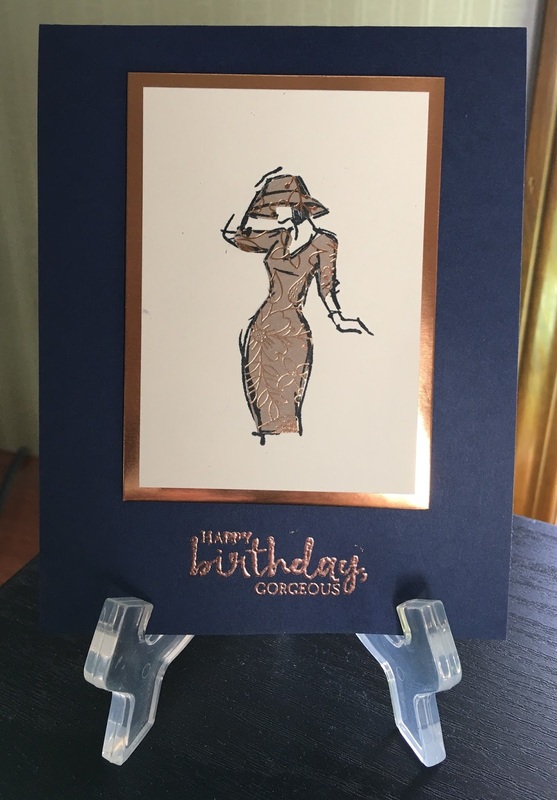 Once again, I used the classy lady but I paper-pieced her even more elegantly! 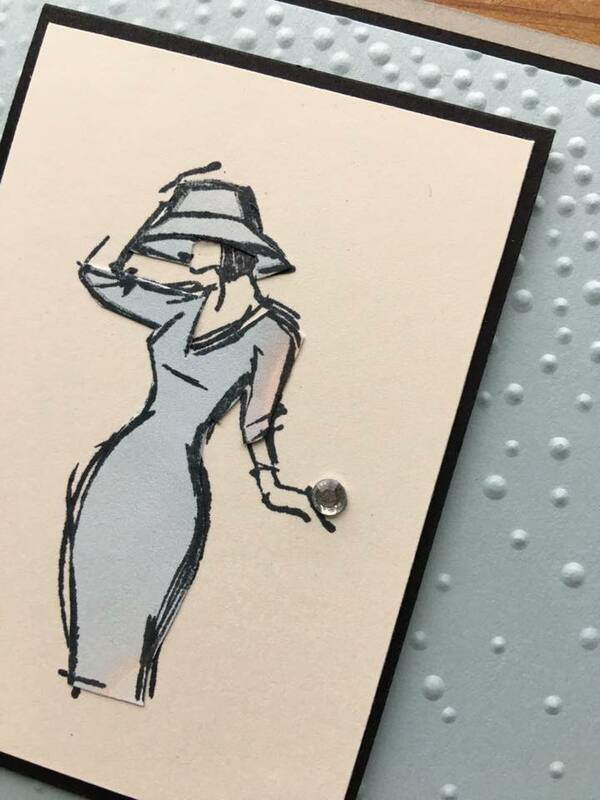 I used the Affectionately Yours Specialty DSP to stamp her dress and hat - same technique as yesterday, called Paper Piecing. Notice the Copper Foil mat and the copper embossing at the bottom?! 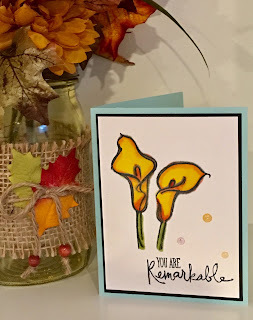 Save this card for someone special!! That reminds me! Please leave me a comment with your birthday, because you're special to me!! I want to send you a card on your birthday -- I tried this last year, but this year I'm SERIOUS!! If I don't have your address, I'll need you to email that to me HERE. 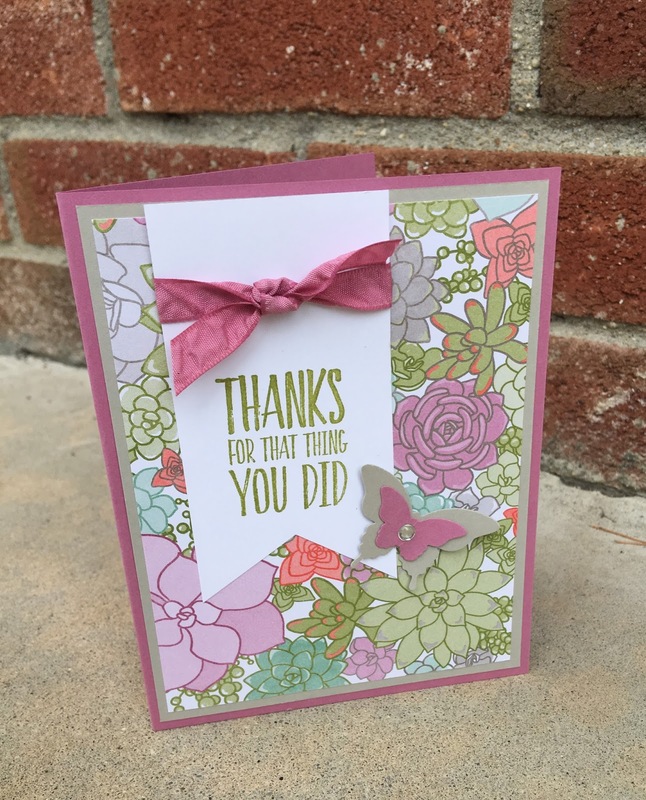 The new Occasions Catalog and the Sale-a-bration catalog went live today! I'm so excited! 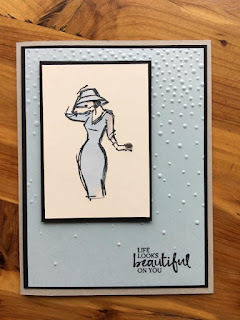 I was able to pre-order in December, and one of the first stamp sets I bought was Beautiful You. It's such a gorgeous set -- the ladies are SO stylish (unlike me who lives in scrubs or yoga pants!!). 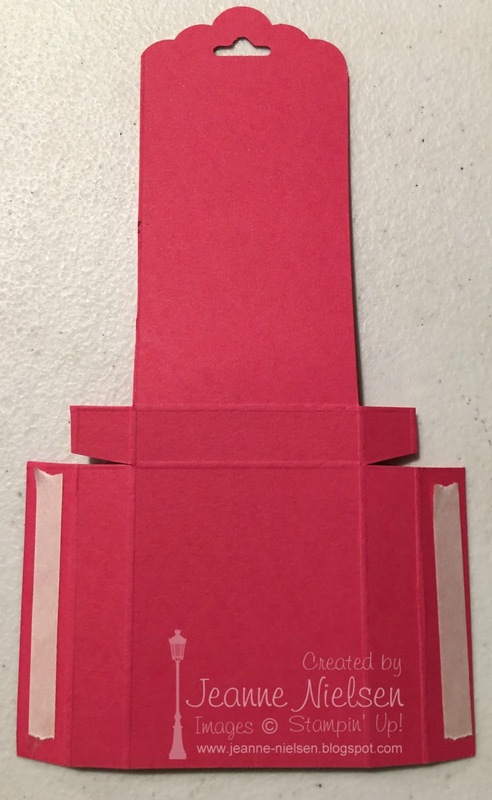 I wanted to share one of the swaps I made with this set. 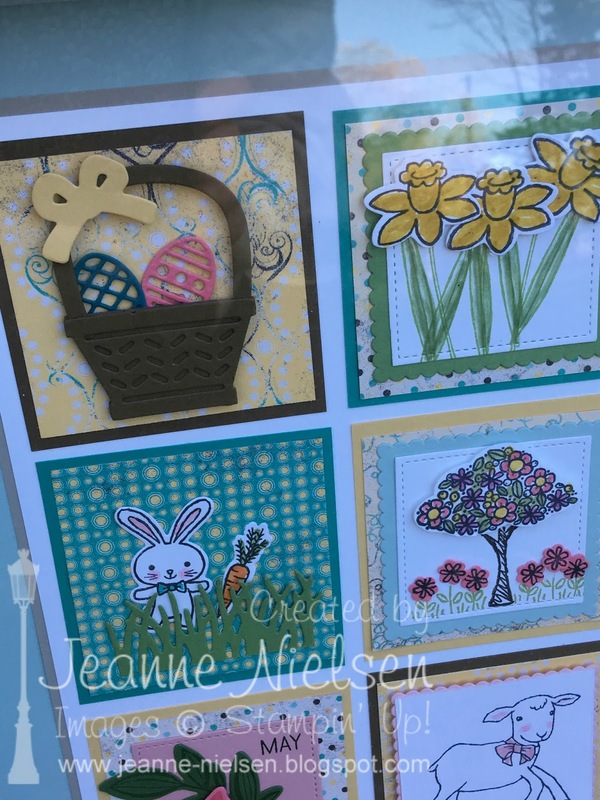 The cardstock I used is Soft Sky with Sahara Sand. 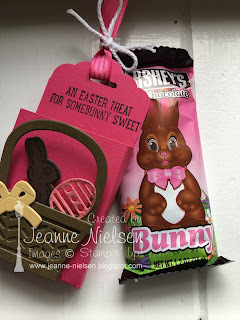 I used the Softly Falling embossing folder for some texture. Do you notice the dress? I paper-pieced that, meaning I stamped the image on a piece of Falling in Love designer paper, then fussy-cut the hat and dress (the dress is the easy part -- good thing I didn't have to do around her lovely fingertips!). Want to see a close-up? Do you see that "rock" on her left hand?! Such bling!! It was the smallest of the Basic Rhinestones but it still looks huge!! If you want an ingredient list, check the supply list below! That's all for now!! 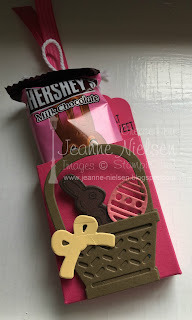 I hope to have another swap for a different group to share with you tomorrow!! I love the new catalog!! Let me know if you need me to send you one! !